Want to know what coupons are in the Sunday paper before you buy it? You can find out by checking Sunday Coupon Preview! 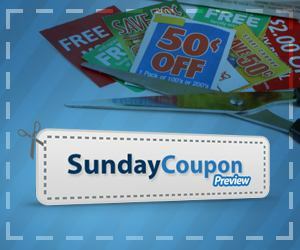 Each week Sunday Coupon Preview provides information on what coupons will be in the Sunday coupon inserts. It’s a great way to help you decide if you want to buy extra copies of the Sunday paper or just skip the purchase altogether. It looks like there will be three coupon inserts in the Sunday, June 2, 2013, newspaper – a Smartsource, a Red Plum, and a P&G insert. You’ll find savings on General Mills, Softsoap, Neutrogena, Aveeno and more. Visit Sunday Coupon Preview for more details. I’ve used Sunday Coupon Preview for quite awhile now, and I’ve found that while some coupon inserts and specific coupons listed may vary by region, the site offers a pretty accurate assessment of what you’ll get when you pick up the Sunday newspaper. Are you new to couponing? Get our free eBook Guide to Saving Money on Groceries when you sign up for our free e-mail newsletter! Looking for more coupons? Check out our coupon resources. Note: This post contains affiliate links that help support this site at no additional cost to you. Please see our full disclosure policy for more information.